Guest post from Patrick Sisk, participant in the upcoming Tour de Cure on June 9th at Rees Pioneer in Brigham City. Legacy Parkway Bike Path - The Legacy Parkway Bike Path is a great trail for riders of all levels. It begins on the North end of I-215 in North Salt Lake, and is a paved trail all the way to Davis County. It follows the scenic Legacy Highway, and is a perfect choice for all ages. Antelope Island - Antelope Island is located in Davis County, and offers beautiful scenery of The Great Salt Lake. There are nearly twenty miles of trails for cycling. The Lakeshore Trail is two miles long, and is perfect for beginner riders or riders with small children. Experienced riders will enjoy the White Rock Bay Loop, which is nine miles of back country trails. Suncrest - Located in the southern part of Salt Lake County, this is a ride full of hills for the more experienced riders. The trail begins where the Frontage Road for I-15 meets Bangerter Highway. It follows the point of the mountain and along the Alpine Highway into Utah County. Little Cottonwood - Also called the Little Cottonwood Pipeline, it's a lower altitude ride that starts at the base of Little Cottonwood Canyon. It's a quick ride that covers seven miles round trip. The Rail Trail - Covering scenic views in Wasatch and Summit Counties, The Rail Trail is a historic ride with views along the Union Pacific Railroad. The trail begins in Park City and and follows I-80 through Wanship, Coalville, and Echo Reservoir. This is a non-motorized trail, which makes it perfect for biking. My daughter was diagnosed five years ago with type 1 diabetes. I vividly remember that day sitting in the examination room and listening to the doctor tell us "Your daughter has type 1 diabetes", and feeling helpless. Everything stopped! It was a bold realization that not only had my daughter's life changed forever but so had ours. I remember packing a small bag for me and my daughter and heading up to Primary Children's Hospital to spend the next four days getting her blood glucose levels in check and learning all about what it takes to manage diabetes. We all cried a lot over the next few days feeling overwhelmed with a roller coaster ride of emotions. It certainly changes your perspective on life and being a parent when something like this is put in your path. I stayed with her the entire time sleeping on that small cot in her room that more closely resembles a mid evil torture device. Of course I really didn't sleep much but instead remained vigilant waking up throughout the night to check on her and whenever the nurse came in to check her blood glucose levels or draw blood. We spent portions of the day between a haze of emotions and sleeplessness learning from dieticians, nutritionists, and the endocrinologist how to count carbs, what foods are better for people living with diabetes, and maintaining an active lifestyle. I remember taking the syringe full of saline solution and practicing injections on oranges and thinking as a parent you are always of the mindset to protect your child, now you want me to take a sharp object and stick it into my child, and this is a good thing? Five years later and about 10,000 injections, we are still in the fight to stop diabetes. Support me and my daughter with a donation and lets change the future for those living with diabetes. 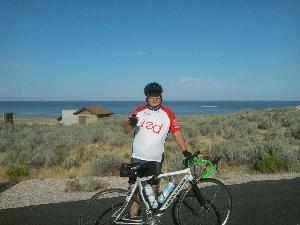 I will be cycling in the American Diabetes Association's Tour de Cure fundraising event. Select the "Sponsor Me" button. Our efforts will help set the pace in the fight against diabetes. So let's get in gear and ride to Stop Diabetes! Help Make a Difference in the fight against diabetes! Each mile I ride, and the funds I raise will be used in the fight to prevent and cure diabetes and to improve the lives of all people affected by diabetes. No matter how small or large, your generous gift will help improve the lives of nearly 24 million Americans who suffer from diabetes, in the hope that future generations can live in a world without this disease. Together, we can all make a difference!